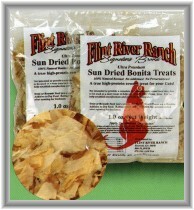 Welcome to NaturesPet.com's gateway page for Flint River Ranch Super Premium Pet Products. Our Distributor Number to be used when calling or inquiring FRR for all orders and questions is N996. Due to serious medical issues we are unable to continue selling all products except Flint River Ranch Super Premium Pet Foods and Pet Products until further notice. We hope the situation will improve in the long term and we can relaunch our full site. 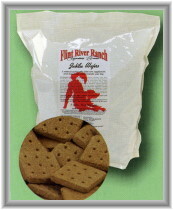 In the interim, for you to order your Flint River products you have several options: You can simply call Flint River Ranch toll free at 1 800 354-6858, or click on any link on this page and you will be redirected to our Flint River replicated site where you can order on line or you can call us at 201 796-0627 and we'll be happy to help. Our best recomendation is to call Flint River Ranch at 1 800 354-6858 because each customer has a unique customer number and password and without that it is more difficult to order through the replicated site. We appreciate your loyal business over the last fourteen years and hope you will continue to order your Flint River Ranch products directly through us. If we can be of any help please let us know, we value your business. Simply click on any graphic link to visit our Flint River Ranch only site and learn more about FRR. This Web site is not the official Web site of the Flint River Ranch Company. This site is owned and operated by FRR Independent Distributor #N996. Any pricing or policies, including discounts, claims and return policies, may not necessarily be those of the Flint River Ranch Company and are only supported by the distributor who owns and operates this site. If you're already a Flint River Ranch customer and this is not your original distributor or their site, your distributor may not receive credit for orders placed here. Flint River Ranch's company mission remains to produce the very finest All-Natural, Super and Ultra Premium Canine & Feline nutritional formulas and treats for your beloved pets. Their products are made with care, under individual control and in small batches. Because Your Pet Deserves The Very Best! Flint River Ranch would like to reaffirm that all of their formulas and ingredients are safe. They purchase all of their ingredients from major US suppliers, and their ingredients are subjected to USDA testing. Their lamb is from free-range ranches located in New Zealand. Flint River Ranch Products - MADE in the USA! NO Wheat Gluten! NO Rice Gluten! NO Chemical Preservatives! No By-products or cheap "fillers"
Product tested every 15 minutes to ensure quality, wholesomeness! Your pet's overall health is their top priority! Flint River Ranch Dogs and Cats have a healthier shiny coat, healthy skin and a higher energy level. Flint River's natural, holistic ingredients also have a positive effect on allergic reactions, dental disease, degenerative organ disfunction, and feline urological syndrome (F.U.S. 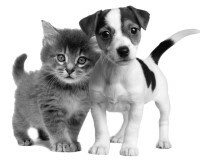 ), often caused or enhanced by low-quality ingredients and chemicals that are common to most other dog and cat foods. Proper diet not only is important for humans, it is the most basic aspect of a pet's lifestyle. Flint River Ranch has been formulated to help your companion animals heal holistically through properly balanced nutrition. The secret to Flint River Ranch's great nutrition is how many nutrients are present in the food and how efficiently they are utilized when digested. One of the things that makes Flint River Ranch exceptional in the industry is that they only use high quality human-grade ingredients. This is in sharp contrast to well over 95% of pet food manufacturers, including Science Diet, Iams, Eukanuba, Nutro, Purina One and Pro-Plan, which all use pet-grade meats, grains and other ingredients. Pet-grade food is food which is deemed unfit for human consumption by the FDA. Pet-grade grains include those which are moldy or rancid, while pet-grade meats include those termed "4D," which refers to meat and other products derived from an animal which arrived at the slaughterhouse either dying, dead, diseased or disabled. From these 4D meats come the by-products which are also used in these foods. By-products are a mix of such items as chicken feet, chicken heads, duck heads, beaks, fish heads, hides, hoofs and intestines. How can we justify feeding dead food to the pets we love? In addition to rejecting pet-grade foods and by-products, Flint River Ranch uses no artificial colors or flavors, and no ethoxyquin, BHA or BHT, propyl gallate, propylene glycol or other chemical preservatives. Perhaps the most notable of these, ethoxyquin, has been the subject of a great deal of debate, as ethoxyquin is classified as a pesticide. Fresh from the oven to your door. Flint River Ranch does not sit on the shelf! FREE Shipping to your door anywhere in the Continental USA by UPS! What sets Flint River Ranch apart from the rest? More and more pet owners are becoming aware of just how important nutrition is for the health of their dogs and cats. This trend in "health" oriented pet foods can be seen on television every day. Many well known "large commercial" pet food brands are attempting to convince us through their advertising that their products are "natural" and "healthy." However, when you closely review their labels a very different picture is unfolds. Their colorful, glossy bags with pictures of healthy, lean cuts of meat and tons of fresh vegetables contain some very questionable ingredients like animal by-products and chemical preservatives like BHA, BHT and Ethoxyquin. What this really amounts to is a lot of hype and marketing sizzle and nothing to do with producing a high quality, all natural pet food. 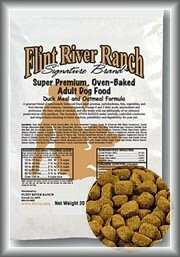 Flint River Ranch Pet Foods do not come in fancy bags with pretty pictures on it. FRR does not spend millions advertising their product on national television. 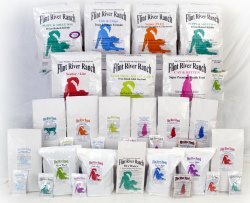 What Flint River Ranch does is produce only high quality, human grade pet foods with all natural ingredients. In fact, the food is so good that the Whole Dog Journal has consistantly rated Flint River Ranch as one of the top ten dry dog foods. Flint River Ranch products are successful because FRR creates satisfied customers who see their pets health improve, their coats become shiny and their energy levels increase. These same satisfied customers tell their friends and family about Flint River Ranch. Perhaps you may even be reading this information now because someone recommended this wholesome, natural food to you. However, no matter how you found Flint River Ranch your companion animal will thank you for doing so! Top Breeders, care about their pets and know that you do too. 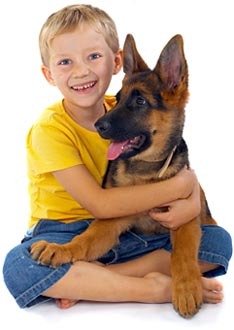 That is why they have sought out the healthiest pet food products you can give your dog or cat. 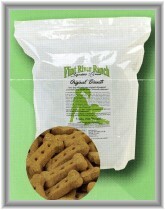 Flint River Ranch holistic dog and cat food is that food. Top Breeders strongly endorse Flint River Ranch Super Premium Holistic dog food and cat food. It is filled with all the necessary vitamins and minerals to keep your cat and dogs healthy. Flint River Ranch Super Premium Health Food For Pets is formulated to help your companion animal heal holistically through properly balanced nutrition and has been called the next best thing to home-cooked meals! WHY OVEN-BAKED DOG FOOD? 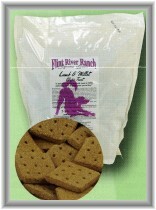 Flint River Ranch, Super Premium All-Natural Formula, is slowly TWICE OVEN-BAKED under carefully controlled conditions and proper temperatures. This unique baking process changes the hard to digest molecules of "raw" starches into easy to digest dextrines. This process acts as a "pre-digest" of the kibble food, resulting in less strain on the dog's digestive system and produces a greater degree of food absorption. A dog's intestinal tract is short; it functions in the most efficient manner when the food is concentrated and can be quickly digested. The important vitamins, minerals and food ingredients are then easily assimilated into the dog's digestive system. EXTRUSION vs QUALITY OVEN-BAKING: Most companies prepare their food by steaming it as quickly as possible, usually less than 3 minutes, then extruding it under extreme pressure through a metal die (A steam extrusion process). This process expands the food with air creating a uniform shape. This method does not produce the highly digestible food that your dog's system requires. This extruded food (cooked in a very short time) is usually almost "raw" and requires the addition of what many nutritionists feel are harmful chemical preservatives (Ethoxyquin, BHA, and BHT) to maintain a reasonable product shelf-life. These chemical products may be associated with dry skin, allergic reactions, dental disease, poor health and degenerative organ dysfunction. OVEN-BAKING PROCESS: In the oven-baking process, a small 2 inch size biscuit is baked while it moves slowly through the oven. Then it�s broken into smaller, irregular kibble ranging in size from tiny morsels to about 1/2 inch, and sent through the oven again for a second baking, producing a highly digestible and vitamin-rich food for your dog. DIGESTIBILITY / PALATABILITY: Flint River Ranch dog food scores in the high 90's for digestibility and palatability -while most extruded food is in the low to mid 80's on a scale of 100. SMALL / FINE MORSELS: The smaller morsels are very important as they digest very quickly in the dog's system helping create immediate nutritional value for your pet. Dogs don't eat food - they "wolf' it down - small pieces digest easier in the dog's system. This is what makes the food so great! The larger, crunchy kibble naturally cleans teeth, exercises the gums and freshens breath. WHY 23% PROTEIN? It is not the amount of protein in a dog food that is important, it is the type of protein and how easily it can be digested. The protein is the right amount for all stages of life. In some cases of working dogs or dogs under high stress, the addition of meat protein can be considered. BAKING TEMPERATURES? Any cook can mix ingredients - the secret is in the total cooking process. This is one of the reasons our food is not easily duplicated by other manufacturers. COLOR OF THE FOOD? An oven-baked food will have various shades of colors - from the soft light inside to the heavy brown crunchy outside crust. Oven-baked food is food in its' natural state. No oils or liver digest is sprayed on the food to encourage a dog to eat. Like all natural things in our environment, as well as the baking process - color of the food will vary from time to time. CONCENTRATED TO FEED LESS Since the food is concentrated, there is more value with less food consumed. Feeding oven-baked foods require 20-25% less food than steam-extruded foods. Pet owners will find fewer odors and stool clean up. Feeding Flint River Ranch quality products, you will be able to see the difference in your pet's health, skin, coat, energy level and quality life-style. OVERWEIGHT DOGS? We find many pet owners still feed the amount of oven-baked food they normally would feed with other brands - about 3-4 cups for a 55 lb. dog. With concentrated premium foods, it is best to feed about 25% less. Dogs may require a little adjustment over a period of time to shrink their stomach and reduce their food intake. Lightly cooked vegetables of all types can help while the dog's system adjusts. Improper feeding is the greatest cause of a dog being overweight, not the quality of the food. The products marketed by Nature's Pet Marketplace are not intended to be the sole source of treatment or to take the place of expert veterinarian care. Please consult with your veterinarian and ask about using a natural and alternative approach for the treatment of your pet.